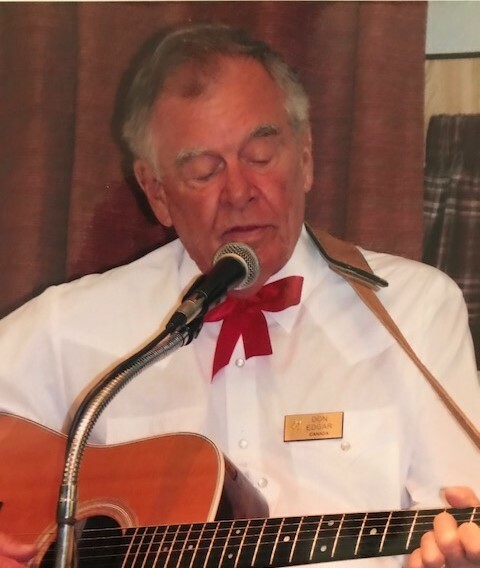 Donald (Don) L Edgar of Pike Bay died peacefully in Wiarton, Ontario on November 19th, 2017 at the age of 82. Don is survived by his wife, and best fishing buddy for 63 years, Phyllis J. Edgar (Seibert), their son, and 2nd best fishing buddy, Scott Edgar (Barbara) of Omaha, NE, 4 Grandchildren: Spencer Baggiani (Paula) of Omaha, NE, Melissa Ioan (Ionel) of El Paso, TX, Jessica Artz (Alex) of Boulder, WY, and Joshua Edgar (Mackenzie) of Omaha, NE, and 7 Great Grandsons: Dominic, Sam, and Luca Baggiani of Omaha, NE, and Andrei, Gabriel, and Adrian Ioan of El Paso, TX, and Walker Baggiani of Illinois. He is also survived by his 3 sisters, Jean Penkal of Mission, TX. Linda Hittle of Deer Lodge, TN. and Arlene North of Huber Heights, Ohio, and many amazing nieces, nephews, and cousins. Predeceased by his 2 daughters: Sharon Edgar (Wiese), Susan Edgar (Terrazas), and Grandson Mundo Terrazas. The family would like to sincerely thank the nursing staff at the Wiarton, Ontario hospital for their love, compassion, and professionalism. Also a huge thanks and much love to Dr. Megan Grigg. Without her amazing care, Don may not have been with us as long as he was. No formal services are to take place. If there were a gathering of friends or family, he would want to be there leading a sing song. Please direct any memorials to the Wiarton Hospital Auxiliary at 369 Mary St. Wiarton, Ontario N0H 2T0, or any charity of your choice.